NOW that a fiscal framework has been agreed between the Scottish and UK governments, it’s time to get down to business when it comes to using the new powers winging their way to Holyrood. Not only do we now get to decide the rates and bands of income tax, but a power that has been devolved for many years – the issue of council tax – has also raced back on to the agenda. Both of these issues could see a significant change in what people lose from their pay packet, and what goes to the local authority every month. In parts of Edinburgh, where property prices are gathering pace and new stamp duty rates are placing family properties even further out of reach for many, these two issues will be of particular interest. Labour and the Liberal Democrats have started their Holyrood campaigns by pledging to increase income tax by a penny. That may sound like a small amount, but look at the figures in detail and it soon becomes clear just what that means. A newly qualified nurse would pay an extra £145 a year – which is actually a five per cent rise. We don’t know what the SNP’s plan is yet for income tax, but given the party’s criticism of Scottish Conservative proposals to aspire to reduce the burden of taxation on hardworking people, we can assume they want to hit people in the pocket, too. All three of those parties have suggested, through the Scottish Government’s commission on local tax reform, introducing new top bands of council tax. In the Capital, that would hike the top rate from £2338 a year to more than £3500. Everyone accepts the need for councils to be properly funded, and that one of the central ways of doing this is through council tax. But we also know many local authorities are too big, have too many people who are paid more than is necessary, and pay massive severance deals far too freely. So when it comes to bins being collected, roads being repaired and schools being properly staffed and equipped, why is it the residents of Edinburgh who have to pick up the slack created by other failings? It’s too simplistic to say local government can’t afford to do things properly any more, and the only solution is to whack everyone’s council tax up. It’s wrong-headed and unfair. People are happy to play their part, but in return they need an efficient council which can prove the money they’re taking from people’s bank accounts is being responsibly spent. 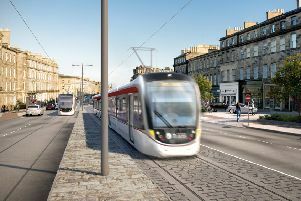 In Edinburgh more than anywhere – with extortionate trams projects and overzealous parking wardens raking in cash – there is work to do for the council on that side of things. For our own part, we commissioned an expert study on taxation earlier this year. The key finding was that people here should not have to pay more in tax than anywhere else in the UK. And now that power is coming to Holyrood, the Scottish Conservatives will absolutely stand by that principle. • Miles Briggs is Scottish Conservative candidate for Lothians at the Scottish Parliament election in May.